The best way for a heart surgeon to prepare for a procedure is to get a good look at the heart in question. Typically, this will mean MRIs, CAT scans and X-rays. However, there are some situations when those two-dimensional images aren’t enough. Such is the case with baby Roland Lian Cung Bawi. His tiny heart was beseeched with defects that would spell out a short life with chronic ailments unless something could be done. That “something” meant surgery at the hands of Dr. Erle Austin of Kosair Children’s Hospital in Louisville. After getting conflicting opinions of Roland’s 2-D scans, Dr. Austin decided to go extremely high-tech. For that, he would need a group of engineering students. At the University of Louisiana engineering school, students were making full use of a 3-D printer in all sorts of applications but none where a life was as stake. Dr. Austin asked for and received a polymer model of Roland’s heart that showed off all the problem areas. “Once I had a model, I knew exactly what I needed to do and how I could do it,” said Austin to the Courier-Journal. Thanks to that model, he was able to reduce the number of exploratory and the overall operating time. 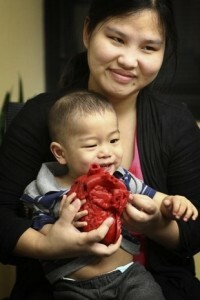 This would be the first successful surgery using a 3-D model of a pediatric heart patient. Aside from the cool factor of creating a 3-D object from a computer-generated image, the 3-D printer is being used for many medical applications. It has been used to render models of bones, organs, tools, devices and prosthetics. There is ongoing research that might ultimately lead to 3-D printers using human cells to create organs from scratch. This is truly the stuff of a sci-fi future. The challenge with pediatric surgeries is that doctors need to delve into a very tiny and delicate organ. At this level, it is extremely difficult to see where abnormalities have occurred even with the best of scans. Sadly, Roland was born with long list of heart complications including a hole in the heart, misaligned aorta and pulmonary artery. All of this prevented the heart from pumping blood, as it should. “I didn’t think he would survive,” said Roland’s mother through a translator. 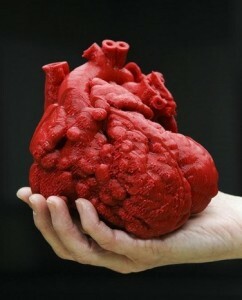 It took around 20 hours to create a duplicate of Roland’s heart that was blown up to two times its normal size. This presented a clear path for the surgical team to follow. Last week, Roland came back to the hospital for a checkup and all signs point to a happy, healthy future. “I couldn’t express my feelings,” said mom. “He sleeps good. He plays. He smiles a lot.” In other words, just what the doctor ordered.